I am going to start recording the crazy stories I read about DIY pest control. If you know of any, please send them along. Man trying to destroy bedbugs sets apartment ablaze. Mistletoe is a common problem. We are asked, on occasion, about what can be done to control it. The bottom line is that there is no practical chemical control available currently. The best option is pruning back the mistletoe, and then wrapping it in black plastic for a year. The chemical they are talking about is a plant growth regulator, Ethephon. Florel (https://www.harrells.com/resources/exports/file?n=FLOREL&t=label) has the same active ingredient, ethephon, and a CAUTION label, but is not labeled for mistletoe, and that is likely because it contains only 3.9 percent, versus the 10 percent used in the research. They used Florel Pro in that 1991 research, but Florel Pro is not listed in the CDPR database. But it is an older publication, as Florel is not currently approved for the use. Branch removal, pruning back the mistletoe, and then the use of the black plastic wrap may be the better option, as you won’t have the chemical hazard, and related regulatory hassles, to deal with. Q. What treatment options are available? Q. What is the spraying procedure? Q. What is the best material to spray on a pine tree? A. It is probably carbaryl, as it gave two field season control of bark beetles. See “Effectiveness of Bifenthrin (Onyx) and Carbaryl…“. However, carbaryl is a restricted material, requiring a permit, and the Agricultural Commissioner may choose to not issue the permit. So we use pyrethroids. Q. What pyrethroids are used? A. Permethrin and bifenthrin are the most commonly used pyrethroids. If you read the “Advances paper” you will see they also tested Asana and Tempo, but neither material is registered for this use. Q. How often should the pines be sprayed? A. The research papers report variable results, but in general, both permethrin and bifenthrin gave one-season control. The residual lives are similar for both permethrin and bifenthrin (see these references: X,Y,Z). The chemicals can break down or dissipate due to photodegradation (sunlight), microbial activity, oxygen, and moisture. The “Advances” paper referenced a study in which 0.2% and 0.4% permethrin provided control for four months against western pine beetle attack on ponderosa pines. This falls in line with the residual life data. There are two to four generations of western pine beetles per year (source). This means the spray should be ‘fresh’ for the whole season. So to answer this question, we suggest a minimum of one time per year. 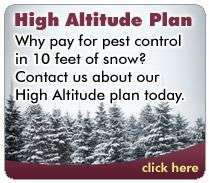 In consideration of the high risk the trees are facing, the relatively short life span of the pyrethroids, and that multiple generations of beetles are produced in a year, we offer a twice-a-year spray program, roughly spring/summer and summer/fall, in an effort to keep the defense active. Q. Which pines should be sprayed? A. If the pine is dead, it is too late. Pine trees that are fading are going to die; fading is considered an irreversible sign of impending mortality You cannot save them. Trees that are under mass attack are probably going to die too. For a good description of a mass attack, see http://www.barkbeetles.org/spb/idbspbb/IDBLCB.html. If the trees are looking good, then get them sprayed, as you cannot wait until they start to die or show signs of attack. Q. How effective is spraying? A. It is not 100 percent. Sprayed trees can still die from beetle attack. Sometimes they simply die from lack of water. If you look at Table 5 in the “Advances” paper, (shown below) you will some data. Mortality of treated trees ran from 8 to 12 percent, versus 70 percent for untreated trees. And if you read further, and more papers, you will see that sometimes reported mortality was much higher, as that was how researchers could tell if a particular treatment regime worked or not. So there is no guarantee that spraying will save your trees, as there are many variables at work. Pine tree mortality with and without spraying. A. We are set up to do Tree-Age injections , using Emamectin Benzoate. It is slow to do, and very costly, with typical market pricing coming in at $12 plus per diameter inch. A two foot diameter pine, being 24 inches in diameter, would cost, maybe, $288.00, and that is for one relatively small pine. If you look at tables 2, 3, and 4 in “Effectiveness of Two Systemic Insecticides for Protecting Western Conifers from Mortality Due to Bark Beetle Attack” you will see that mortality rates are all over the map, sometimes approaching 100 percent. Our staff has seen the results of some injection jobs done by other companies that had 100 percent mortality. If you don’t mind spending thousands of dollars and seeing the trees die, injection is for you. Q. What about Splat-Verb, the anti-aggregation pheromone? A. It does not work against western pine beetles, and is highly variable against mountain pine beetles. See our blog on this, where we discuss the issue in detail. Q. What about watering the pines? A. Water them if you can. There is no published research on the effects of watering, but it makes a lot of sense. If you can afford it, and there are no restrictions on water use, consider watering the pines. The anecdotal reports we are hearing confirm the value of watering your trees. Remember that it is good sap flow that allows a pine tree to ‘pitch out’ the invading beetles. Without water, the tree cannot do this. Q. What about beetle attacks near the base of the pine tree? What is that? A. Possibly red turpentine beetles. They are not tree killers, although they could further weaken the pine. Digressing, our common red turpentine beetle is an invasive pest in China, devastating their pine trees. Q. What about cedar trees? They are dying too. What can I do? A. Water, and maybe, prune them. 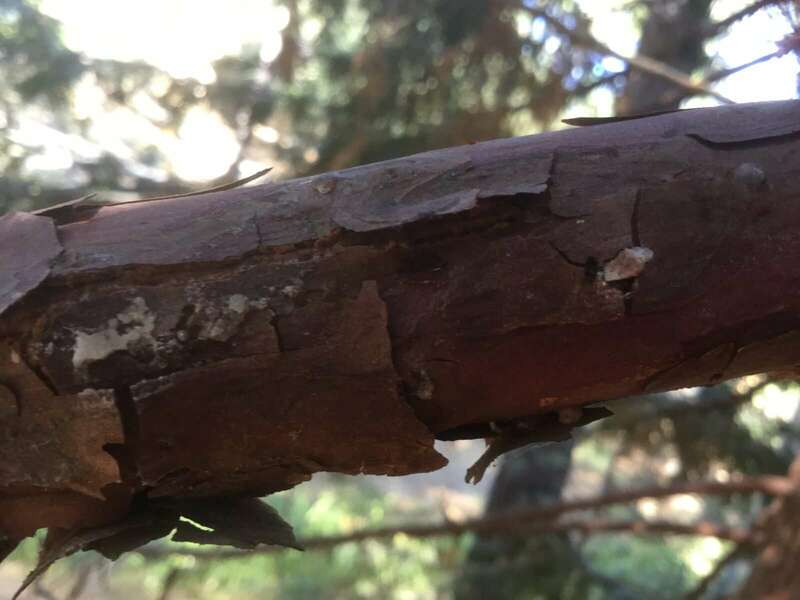 The cedars are dying, apparently, simply because of lack of water, not beetle attack. According to Situation Summary of recent tree mortality on Sequoia National Forest, July 2015, “The sudden widespread mortality in incense cedar is more attributable to the severity of the drought rather than to native pests. All sizes of incense cedar are observed to be fading in Sequoia National Forest. There is no known primary bark beetle or other insect that mass-attack incense cedar. Phloeosinus sp. (=cedar bark beetles) beetles are found in small branches and stems, and woodborer galleries are etched only in a few places on dead trees.” Phloeosinus is also called the cedar, or cypress, bark beetle. Jim Goodrich of Groveland reports (14 July 2016) that his cedars were dying from the bottom up, and that examination of limbs revealed numerous white spots on the branches. He pruned the infected branches and then sprayed the trees. One cedar was half dead. The cedars are now all flourishing. Phloeosinus emergence holes on incense cedar. Groveland California. July 2016. Photo by Jim Goodrich. If you have more questions, call or email us. Many homeowners associations and businesses are recommending the use of SPLAT Verb to protect ponderosa pine trees from being attacked by pine bark beetles. For example, this local article states “Verbenone is naturally produced by MPB and by several other species of bark beetle towards the end of a mass attack.” This text exactly matches the text at the isatech.com website, so it appears not much work was put into researching this. What the article, or any other local sources, bother to state, and probably do not know, is that SPLAT Verb, alone, is not effective against western pine beetles. The local promoters of the use of SPLAT Verb are confused, and are giving misleading information to the public. The active ingredient, verbenone, is an anti-aggregation pheromone that works against the MOUNTAIN Pine Beetle (Dendroctonus ponderosae), not the WESTERN Pine Beetle (Dendroctonus brevicomis). These are different species, with different habits and ranges. The pine bark beetle that is killing our Tuolumne and Calaveras County ponderosa pines is the western pine beetle, D. brevicomis. The mountain pine beetle prefers sugar pine, lodgepole, knobcone, and smaller diameter ponderosa pines. Mountain pine beetles are rarely found in ponderosa pines that are greater than 6 inches in diameter. In California, western pine beetles are by far the most important beetle attacking ponderosa pines, of all sizes, and are the cause of most ponderosa pine mortality. Verbenone is a naturally occurring substance, and is created by the oxidation of alpha-pinene, a component of pine resin. Mountain pine beetles and Southern Pine Beetles use verbenone as a pheromone, and react to it. This 2006 article also says that verbenone is not effective, as a stand-alone agent, against western pine beetles: Efficacy of Verbenone for Protecting Ponderosa Pine Stands From Western Pine Beetle (Coleoptera: Curculionidae: Scolytinae) Attack in California. It states: “No significant differences in levels of D. brevicomis-caused tree mortality or the percentage of unsuccessfully attacked trees were found between verbenone-treated and untreated plots during each year or cumulatively over the 3-yr period.” That means that trees treated with verbenone did no better than untreated trees. The conclusion is this: Verbenone is not effective as a stand-alone treatment against the Western Pine Beetle. It has been shown to be ineffective against this species of beetle, over a three year period, and its effectiveness against even the mountain pine beetle is inconsistent. 2. Verbenone Plus Reduces Levels of Tree Mortality Attributed to Mountain Pine Beetle Infestations in Whitebark Pine, a Tree Species of Concern 2012. We have an FAQ page giving some details about other control options. “It’s not a shame to have them; it’s a shame to keep them” is what a nice, older lady told me, probably in the late 1970s, when she called me out for a bed bug job. I thought this was a striking piece of wisdom, and it is something I have not heard anyone else say, before or since. the phrase says a lot, and I placed it here to share her words. It is a good concept to know. Here are some samples of the True Pests© advertising campaign we ran in 2001-2002. Is Delusional Parasitosis a Gluten-Related Disorder? I present here a hypothesis that delusional parasitosis is a consequence of gluten sensitivity. Delusional parasitosis is a syndrome in which the patient has an unshakable belief that they are infested with bugs. About 40% of the cases of delusional parasitosis have no known cause. Antipsychotics are often not effective, and can have severe side effects. Finding the cause of these cases of primary delusional parasitosis would help many patients. Cases of gluten sensitivity, once rare, are on the rise, and in many individuals is expressed solely as a neurological disorder. Gluten has recently been shown to cause hallucinations in some individuals. We hypothesize here that gluten sensitivity may be a cause of primary delusional parasitosis. Medical professionals, as well as entomologists, occasionally are contacted by individuals suffering from delusional parasitosis (Hinkle 2011). These people claim they are infested with bugs, and intent on proving it, provide samples of the bugs, which are typically skin flakes, and dust and dirt, and will show you the ‘bites’, regardless of location. Their belief is unshakable. Delusional parasitosis is considered to be a syndrome, rather than a single disorder. (Lepping 2007). The type of delusional parasitosis that most entomologists encounter is the ‘delusional disorder’, accounting for about 40% of the cases, and is commonly referred to as ‘primary delusional parasitosis’, defined as delusional parasitosis without a detectable cause. Secondary delusional parasitosis is associated with other mental disorders such as schizophrenia and depression, or with substance abuse or adverse drug response. Antipsychotics are the standard treatment for primary delusional parasitosis (Lepping 2007, Freudenmann and Lepping 2009). Pimozide, developed in 1963, was the first-line therapy until around 2003, as it fell out of favor due to drug safety concerns (Lepping 2007). Lepping’s paper also shows that Pimozide was only about 50% effective in terms of producing a full remission. Physicians are switching to the atypical, or second-generation, antipsychotics, such as Olanzapine and Risperidone, for the treatment of primary delusional parasitosis (Scheinfeld 2015). Patient response to atypical antipsychotics is poor, with forty percent showing no response at all (Lepping 2007). Lieberman et al, (2005) reports in a major study examining atypicals, that seventy-four percent of the schizophrenic patients stopped taking their medication within 18 months, due to intolerable side effects. This is similar to the situation with the original antipsychotics (van Puten 1974). Besides being less effective, the atypical antipsychotics are also more expensive, and they appear to produce a lower quality of life than the first-generation antipsychotics (Keefe et al 2007). We have a situation in which sufferers of primary delusional parasitosis have one treatment option, antipsychotics, which have less than a 50% chance of producing a full remission, are expensive, and have side effects that may be worse than the initial problem. Gluten is the general term for the major storage proteins, gliadin and glutenin, found in the endosperm of wheat, rye, and barley. These grains, introduced as a significant component of the human diet with the advent of agriculture, presented us with a new biochemical challenge. The ancient Greeks and Romans were aware of wheat allergy, and they knew of celiac disease, but not its cause (Gasbarrini et al 2012). Celiac disease was forgotten until 1856, when the writings of the Greek physician, Aretaeus of Cappadocia, were translated into English. It was not until 1952, that Dutch pediatrician, Willem Karel Dicke, made the connection between wheat proteins and celiac disease. The medical community mostly ignored celiac disease, seeing it as a rare condition, limited mostly to Europe, even as late as the year 2000. (Sapone et al 2012). Celiac disease is an immune response to gluten, characterized by an erosion of the intestinal villi, which reduces nutrient absorption, and it has well over 50 clinical presentations (Farrell and Kelly 2002). At the 2011 International Celiac Disease Symposium, in Oslo, researchers agreed that non-celiac sensitivity exists, and decided on a terminology (Sapone et al 2012). 2. Non-celiac gluten sensitivity – gluten sensitivity without damage to the intestinal villi. It is currently estimated that 1% of the population in the U.S. has celiac disease, whereas gluten sensitivity is thought to be six times higher (Jackson et al 2012). This estimate, however, may be well below the actual incidence (Leonard and Vasagar 2014), and 30% is a more robust estimate, based on the genetic markers (Czaja-Bulsa 2014). Non-celiac gluten sensitivity is related to numerous neurological conditions. Jackson (2012) did a PubMed search and located 162 original papers, published between 1953 and 2011, associating psychiatric and neurologic complications to celiac disease or gluten sensitivity, including seizure disorders, ataxia and cerebellar degeneration, neuropathy, schizophrenia, depression, migraine, anxiety disorders, attention deficit and hyperactivity disorder, autism, multiple sclerosis, myasthenia gravis, myopathy, and white matter lesions. In some individuals, gluten sensitivity can present solely as a neurological condition (Hadjivassiliou et al 2010). And gluten sensitivity can cause hallucinations. DeSantis (1997) published a case report of a woman showing symptoms of schizophrenia and celiac disease, with psychiatric symptoms, including auditory hallucinations. She responded significantly within a few days to a gluten-free diet, and was still symptom free one-year later. Kraft and Westman, 2009, discuss a case of a 70 year old schizophrenic paitent who had suffered from hallucinations since the age of seven. Her symptoms resolved after starting a gluten-free or low-carbohydrate, ketogenic diet. Lindberg et. al, (2013) give a report of a patient with hallucinations that improved using a gluten-free diet and thiamine supplementation. Genuis and Lobo (2014) presented a case report of a woman, suffering from both auditory and visual hallucinations, from childhood, who showed complete symptom resolution using a gluten-free diet. Klinov and Syrow (2014) give a case report of a woman suffering from visual and auditory hallucinations, whose symptoms disappeared after starting a gluten-free diet. Eaton et al (2015) discuss a 16 year old whose visual and auditory hallucinations disappeared after being on a gluten-free diet. Both delusional parasitosis and gluten sensitivity have links to dopamine. Huber et al (2007) proposed that increased levels of extracellular dopamine can produce delusional parasitosis. Flann et al (2010) reported that three patients taking a dopamine agonist to treat their Parkinson’s disease, and who also had delusional parasitosis, found their delusional parasitosis fully resolved when they stopped taking the antipsychotic, also suggesting that high dopamine levels can cause delusional parasitosis. Gluten can cause higher dopamine levels. Hallert and Sedvall (1983) reported that after one year, celiac disease patients on a gluten-free diet experienced a significant increase in their dopamine metabolite concentrations. With the recent explosion of knowledge about the neurological problems caused by gluten, it is possible that delusional parasitosis may be yet another gluten-related disorder. We would like to encourage medical professionals to consider a gluten-free diet for their patients with delusional parasitosis. Catassi, C., Bai, J. C., Bonaz, B., Bouma, G., Calabrò, A., Carroccio, A., … & Fasano, A. Non-Celiac Gluten sensitivity: the new frontier of gluten related disorders. Nutrients, 2013;5(10), 3839-3853. Czaja-Bulsa, G. (2014). Non coeliac gluten sensitivity–A new disease with gluten intolerance. Clinical Nutrition 2014. De Santis, A., Addolorato, G., Romito, A., Caputo, S., Giordano, A., Gambassi, G., … & Gasbarrini, G. Schizophrenic symptoms and SPECT abnormalities in a coeliac patient: regression after a gluten‐free diet. Journal of internal medicine, 1997;242(5), 421-423. Eaton, W. W., Chen, L. Y., Dohan Jr, F. C., Kelly, D. L., & Cascella, N. Improvement in Psychotic Symptoms After a Gluten-Free Diet in a Boy With Complex Autoimmune Illness. American Journal of Psychiatry,2015;172(3), 219-221. Farrell, R. J., & Kelly, C. P. Celiac sprue. New England Journal of Medicine, 2002;346(3), 180-188. Flann, S., Shotbolt, J., Kessel, B., Vekaria, D., Taylor, R., Bewley, A., & Pembroke, A. Three cases of delusional parasitosis caused by dopamine agonists. Clinical and experimental dermatology, 2010;35(7), 740-742. Freudenmann, R. W., & Lepping, P. Delusional infestation. Clinical microbiology reviews, 2009;22(4), 690-732. Gasbarrini G, Rickards O, Martínez-Labarga C, et al. Origin of celiac disease: How old are predisposing haplotypes? World Journal of Gastroenterology 2012;18(37):5300-5304. Genuis, S. J., & Lobo, R. A. Gluten Sensitivity Presenting as a Neuropsychiatric Disorder. Gastroenterology research and practice, 2014. Hadjivassiliou, M., Sanders, D. S., Grünewald, R. A., Woodroofe, N., Boscolo, S., & Aeschlimann, D. Gluten sensitivity: from gut to brain. The Lancet Neurology, 2010;9(3), 318-330. Hallert, C., & Sedvall, G. Improvement in central monoamine metabolism in adult coeliac patients starting a gluten-free diet. Psychological medicine, 1983;13(02), 267-271. Hinkle, N. C. Ekbom syndrome: A delusional condition of “bugs in the skin”. Current psychiatry reports, 2011;13(3), 178-186. Huber, M., Kirchler, E., Karner, M., & Pycha, R. Delusional parasitosis and the dopamine transporter. A new insight of etiology?. Medical hypotheses, 2007;68(6), 1351-1358. Jackson, J. R., Eaton, W. W., Cascella, N. G., Fasano, A., & Kelly, D. L. Neurologic and psychiatric manifestations of celiac disease and gluten sensitivity. Psychiatric Quarterly, 2012;83(1), 91-102. Keefe, R. S., Bilder, R. M., Davis, S. M., Harvey, P. D., Palmer, B. W., Gold, J. M., … & Lieberman, J. A. Neurocognitive effects of antipsychotic medications in patients with chronic schizophrenia in the CATIE Trial. Archives of general psychiatry, 2007;64(6), 633-647. Klinov, V., & Syrow, L. The Case Of Migraine With Visual And Olfactory Hallucination Related To Food Allergy (P5. 205). Neurology, 2017;82(10 Supplement), P5-205. Kraft, B. D., & Westman, E. C. Schizophrenia, gluten, and low-carbohydrate, ketogenic diets: a case report and review of the literature. Nutr Metab (Lond), 2009;6(1), 10. Leonard, M. M., & Vasagar, B. US perspective on gluten-related diseases. Clinical and experimental gastroenterology, 2014;7, 25. Lepping, P., Russell, I., & Freudenmann, R. W. Antipsychotic treatment of primary delusional parasitosis Systematic review. The British Journal of Psychiatry, 2007;191(3), 198-205. Lieberman, J. A., Stroup, T. S., McEvoy, J. P., Swartz, M. S., Rosenheck, R. A., Perkins, D. O., … & Hsiao, J. K. Effectiveness of antipsychotic drugs in patients with chronic schizophrenia. New England Journal of Medicine, 2005;353(12), 1209-1223. Lindberg, J., Marco, B., & Klas, S. A case of celiac disease with hallucinations. Neurology: Clinical Practice, 2013;3(5), 446-447. Sapone, A., Lammers, K. M., Mazzarella, G., Mikhailenko, I., Cartenì, M., Casolaro, V., & Fasano, A. Differential mucosal IL-17 expression in two gliadin-induced disorders: gluten sensitivity and the autoimmune enteropathy celiac disease. International archives of allergy and immunology,2009;152(1), 75-80. Sapone, A., Bai, J. C., Ciacci, C., Dolinsek, J., Green, P. H., Hadjivassiliou, M., … & Fasano, A. Spectrum of gluten-related disorders: consensus on new nomenclature and classification. BMC medicine, 2012;10(1), 13. Scheinfeld, Noah S. “Delusions of parasitosis.” Available at:) emedicine.medscape.com. (March 12, 2015) View in Article (Updated: Jan 5, 2015). Van Putten, T. Why do schizophrenic patients refuse to take their drugs?. Archives of General Psychiatry, 1974;31(1), 67-72.